Update, December 20: The official PUBG Twitter account has revealed that PlayerUnknown’s Battlegrounds 1.0 will release on December 20 at 23:00 Pacific time, or 07:00 on December 21 in GMT. 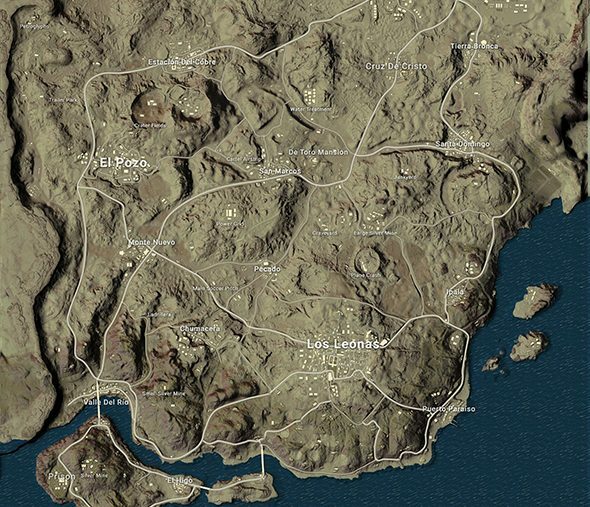 Find out everything we know about PUBG’s desert map. Additionally, server maintenance will begin at 18:00 Pacific time today, or 02:00 GMT tomorrow, and take an estimated five hours. Update, December 11: PUBG’s test servers, featuring the desert map and vaulting, will remain up until the game’s official release on December 20. You can play as much of PlayerUnknown’s Battlegrounds’ desert map as you want right now, because the test servers are currently live – and they will continue to be, up until the game’s 1.0 launch. Players, the test servers will stay open until PC 1.0 comes out on live servers! The transition to Phase 2 will be relatively seamless and there won't be any downtime today. There will be maintenance periods to deploy patches as needed. We highly appreciate all your help. It’s like the full version of PUBG is here, just without that fancy “1” in front of the version number. The latest round of test servers got a delayed start, but they will continue to run until the game’s official release date on December 20. Aside from some downtime for minor updates, of course. That means you can enjoy all the Miramar-hopping, fence-vaulting action PUBG has to offer. Just, uh, put on some pants first, would you? Update, December 8:Here’s a quick rundown of what you can expect from PUBG’s upcoming update. PlayerUnknown’s Battlegrounds now provides a killcam. The latest update, currently live on the game’s test servers, lets you choose to see how you died a few seconds after the end of your game. After your death, the screen fades to black, and after a few seconds an option appears in the bottom-left of the screen allowing you to view a killcam of the final 10-15 seconds of your life, from the perspective of the player who killed you. Sometimes, that’s a sad and embarrassing reminder of your failures, but if you do get killed out of nowhere by a magnificent feat of PUBG-mastery, it allows you to take a moment to appreciate that skill while you mourn the loss of your precious chicken dinner. Last night, it was announced that PUBG’s full release date would be December 20. 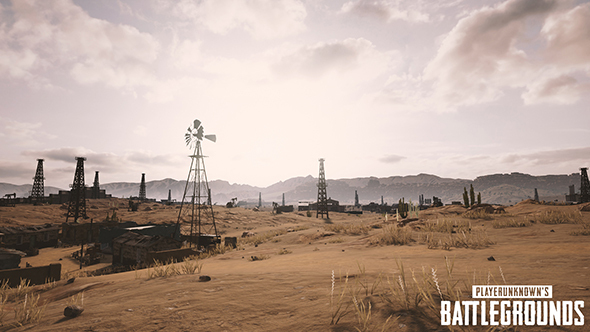 With that full release will come the new desert map, Miramar, several new weapons and vehicles, and from what we’ve seen on the test servers today, new UI. Players have also found that the new sawed-off shotgun goes into their pistol slots, allowing for some early game chaos. Update, December 8:PUBG’s desert map has already been delayed. The release of PlayerUnknown’s Battlegrounds’ desert map has been pushed back. Technical issues mean that the game’s test server opening had to be delayed by two hours. The test servers were due to open at 08:00 GMT (00:00 PST), but PUBG Corp. tweeted at 08:12 to say that “due to a technical issue” that time had been delayed by two hours. Servers will now open at 10:00 GMT (02:00 PST) instead. Due to a technical issue, our test server opening time is delayed by 2 hours. Servers will open Dec 8 2AM PST, Dec 8 11AM CET. We apologize for this delay. 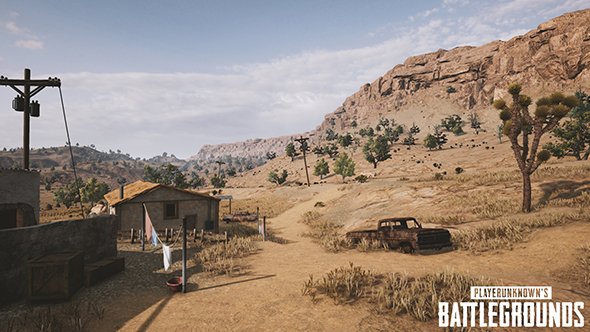 Update, December 8:The desert map for PUBG will be live on test servers later tonight, with the full 1.0 release to come December 20. 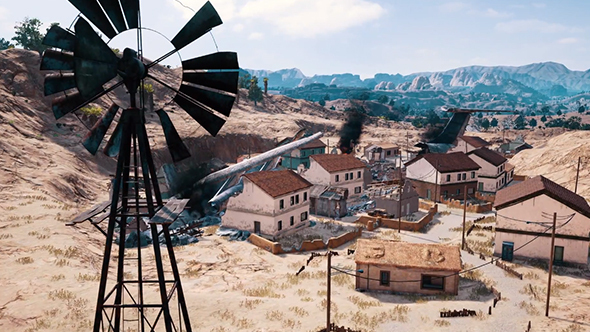 The Game Awards reveal for the PlayerUnknown’s Battleground desert map was pretty straightforward, so you should probably just check out the trailer above for a full look at what to expect. But the real big news is that PUBG will be leaving Early Access and going 1.0 on December 20, with the desert map launching alongside that update. But you won’t even have to wait to enjoy the new map, because PUBG’s desert map will be live on test servers tonight, at midnight PT / 3:00 ET / 8:00 GMT. Update, December7:PUBG is getting yet another new weapon, and a jetski, ahead of its full release. Ahead of its full release (and its new map), PUBG is getting another new weapon. 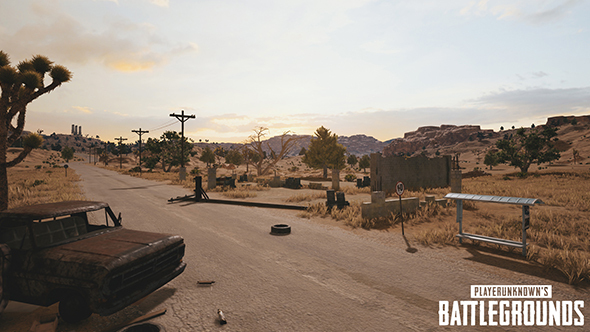 The R45 is a six-shot revolver exclusive to the game’s upcoming desert map, Miramar. The R45 will be replacing the game’s other revolver, the R1895, which will be exclusive to the game’s original map, Erangel. Conveniently, the gun comes with a speed loader, allowing you to reload an entire clip at once, which should alleviate the desperate and terrifying moments as you wait for each individual bullet to be loaded into the R1895. Unlike its ‘European’ alternative, the R45 doesn’t support a suppressor, so you lose a significant chunk of stealth. What it lacks in subtlety however, it makes up for in accuracy, as you’ll be able to equip a red-dot sight to the gun. The R45, as well as the new desert map, vaulting and exclusive desert vehicles, will all arrive with the full release of the game, still scheduled for this month, although they should be available on the game’s Test Server at some time before that. PUBG Corp. also offered a first look at the game’s upcoming vehicle, a jetski first revealed in a datamine last month. Aquarail will be available on both maps when the game’s full version releases. Update, December 6:PUBG’s new desert map has another exclusive weapon. 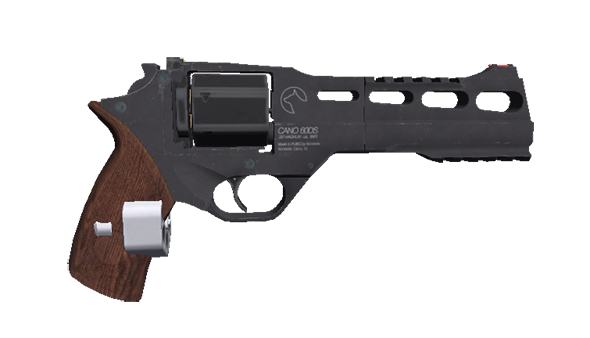 The Win94 is a Winchester lever-action rifle of the kind you’ve probably seen if you’ve watched any Spaghetti Westerns. Or regular Westerns, come to think of it. It will be a world spawn exclusive to PUBG’s forthcoming desert map. The gun was revealed less than a week after the sawed-off shotgun, also exclusive to the desert map, was tweeted out (see below). The map is shaping up to have quite a characteristic arsenal. We’ll see gameplay footage of it at The Game Awards tomorrow. Update, December 1:PUBG’s new desert map is getting an exclusive weapon. The PlayerUnknown’s Battlegrounds Twitter account has revealed that the game is getting a sawed-off shotgun, which will be exclusive to the forthcoming desert map. If you look closely at the shells in the tweeted image, it looks like it might be able to fire incendiary rounds. Reddit’s dataminers uncovered the shotgun a little over a week ago, along with a revolver and a lever-action rifle. A little before that, a jetski, VW minivan, and a new machine gun were also dug up. As always we have to remember that not everything in the game files makes it to the live game, but it’s always exciting when something does. Here’s hoping we see that jetski soon. We’ll see gameplay from the desert map at The Game Awards in six days’ time (see below). 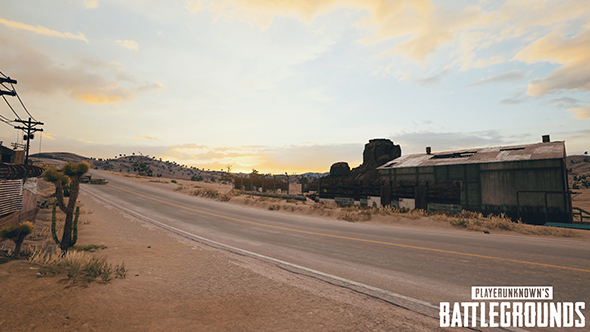 Update, November 30:Gameplay footage of PUBG’s desert map will premiere at The Game Awards on December 7. 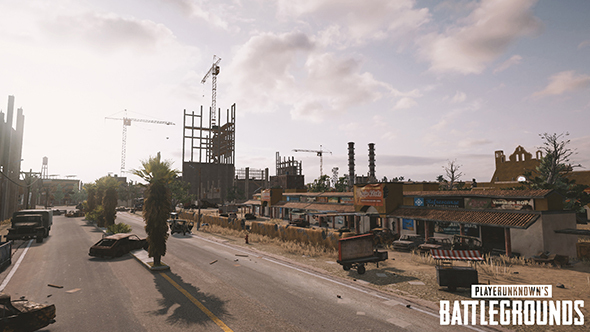 Are you eagerly awaiting the second map for PlayerUnknown’s Battlegrounds? Greedily gobbling up every screenshot and datamined map leak that’s appeared for the desert location? Ready to sell a kidney for a glimpse of the map in action? I’ve got great news for you, because all you’ll have to do to see gameplay of the desert map is endure some Schick Hydro ads. That’s right, Geoff Keighley’s The Game Awards will host world premiere gameplay footage of the new map in action. My real hope is that Keighley pins down Brendan “PlayerUnknown” Green on the really tough questions, like why they dropped “Murderland” as a location name. However, maybe sadly, Schick Hydrobot will apparently not be in attendance at the show. Hopefully the show can pull together plenty more game premieres – and heck, even an award or two – without the pull of that most lucrative guest star. 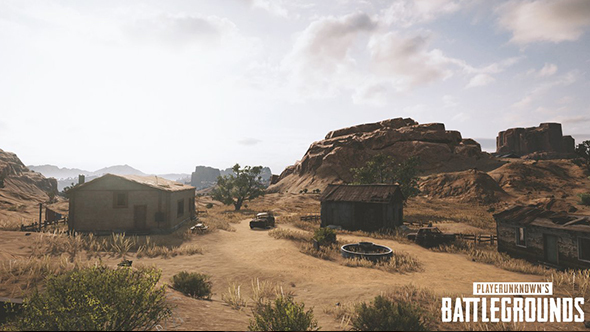 Update, November 23:Another round of datamining has revealed new names for PUBG’s desert map locations, as well as a handful of new weapons. 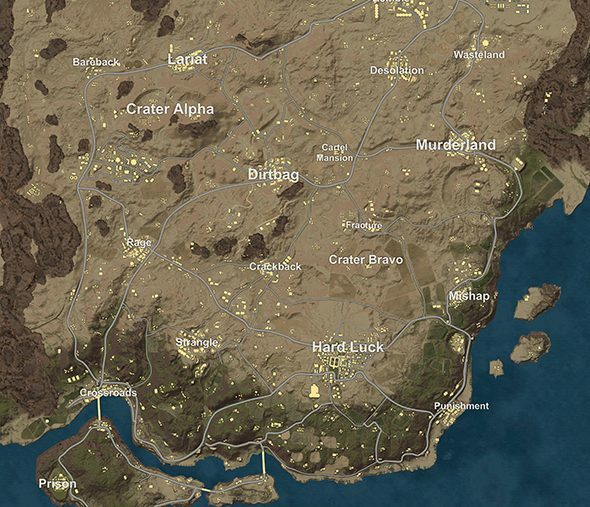 Prolific PlayerUnknown’s Battlegroundsdataminer bizzfarts(I can almost type that with a straight face now) has dug into the game files once again, this time digging out what appears to be the final version of the desert minimap from the latest test server. Sadly, we’ll have to say goodbye to “Murderland,” because the auspicious town is now known as Santa Domingo. Unfortunately, we’ll have to say farewell to many excellent place names, including Crackback, Dirtbag, Lariat, Zombie, and Desolation, in favor of some more flavorful Spanish titles. The map as a whole is to be called Valle Coronado, and you can see a full-sized version of the map here. That’s not all, as bizzfarts (never mind, I smirked that time) has also dug up models for new weapons, including a Winchester rifle, Rhino revolver, and a sawed-off double barreled shotgun. I look forward to seeing if PUBG can play like Doom, and it’s worth-noting that the shotgun was listed among the pistols. Though no model is available yet, it appears a UI icon for a flare gun is also in place. 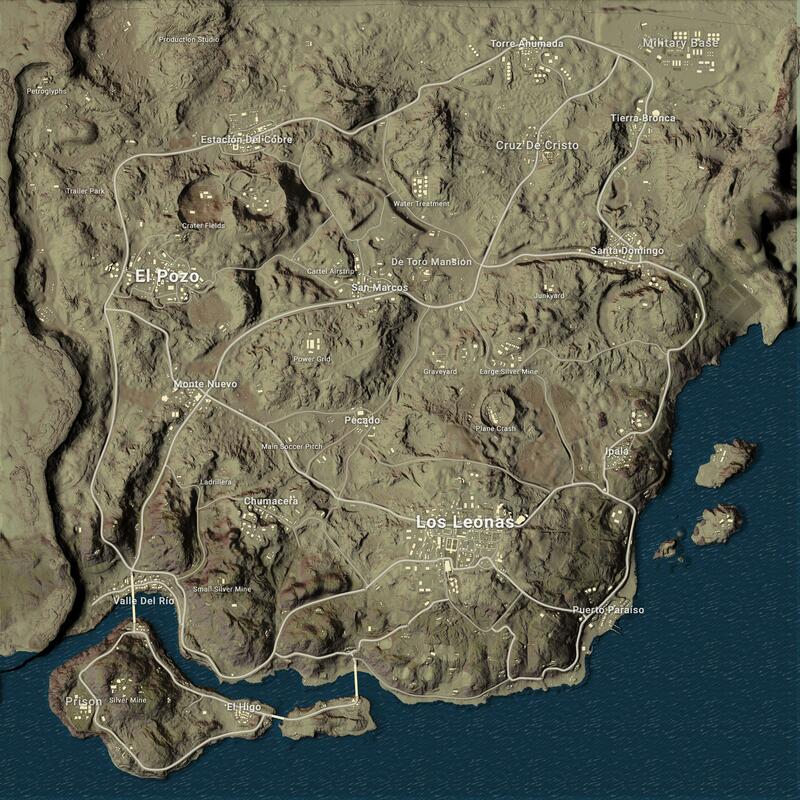 Update, November 16:Another round of screenshots and another datamined minimap bring us closer to the release of PUBG’s desert location. The year is 2017, but we’re partying like it’s 1997 because it’s time to get excited about some screenshots. Remember when screenshots were newsworthy? When it comes to PlayerUnknown’s Battlegrounds first ever alternate map, they still are. Nvidia provided the fresh handful of screens, along with promises that the game’s running better than ever on 10-series GPUs, and really anything on the performance front is much appreciated. Marvel at the rustic town. Wonder at how many times you’ll be sniped wandering down those lonely plains. In addition to the official look at the map, a bit of datamining has revealed another look at the map’s overall structure. It’s pretty similar to the unearthed minimap we saw earlier in the year – also from redditor bizzfarts – though with a few tweaks and a fresh art pass. You can get a larger look at the map here. PUBG is still set leave Early Access by the end of the year, with the desert map and vaulting being the headline additions for the 1.0 release. But Brendan “PlayerUnknown” Greene still thinks you should probably vote for Zelda or Horizon as game of the year. 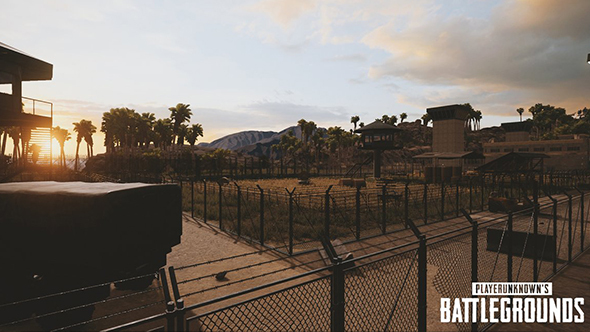 Update, November 9:The desert map inches closer to release with a new batch of screenshots. 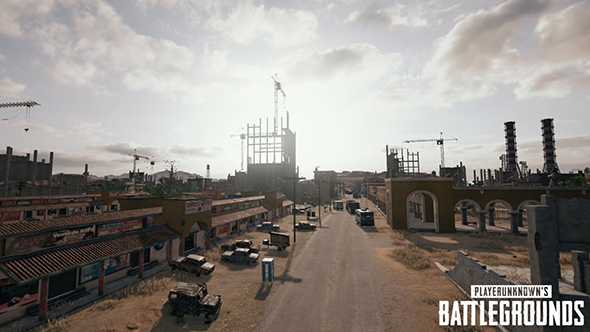 Can’t contain your excitement over the fact that we’ll soon have a second map upon which to murder in PlayerUnknown’s Battlegrounds? Well,PlayerUnknown himselfjust made the wait a bit easier – or a bit harder, depending on where your anticipation is at. There’s a batch of new screens showing it off. Original Story, October 31:We weren’t sure what to expect from today’sXbox streamfor PlayerUnknown’s Battlegrounds. Sure, there would be details on the console edition of what’s now probably the world’smost popular game, but we weren’t certain if there would be anything relevant to PC players. Turns out, we got a rough release date for the 1.0 version of the game and the desert map. PlayerUnknown’s Battlegrounds will leave Early Access in late December, and this 1.0 release will feature the new desert map – and presumably vaulting, which is scheduled for testing in short order. The Xbox One version of the game will release on December 12, with vaulting and HDR support implemented. The desert map will come to this version some time later. Time was running out for PUBG to meet its planned release date of 2017, but it looks like the team will just be managing to squeeze by after all. How often does a game come out after it’s already one of the most profitable titles in the world?